Although we don’t necessarily have an ‘IT’ coat in the same way that womenswear does, menswear tends to lean towards a classic outerwear silhouette each season. Whether it’s the bomber, duffle or in the case of this year, the motorcycle jacket, the style DNA is retained whilst the aesthetic is updated for the current market. Two big names, Matchless and Belstaff, have been rebranded recently with the aim of making the motorcycle and its history the centrepiece of their brands. Fashion labels have quickly realised that they need to have a strong signature look and take ownership of a timeless piece – in much the same way Burberry has done with the trench coat – in order to thrive in this competitive market. By focusing on something people are willing to pay a premium for, i.e. the motorcycle jacket, they have the potential to catapult the brand into the big league – but it’s a long and difficult journey. Form always followers function, and whilst men were discovering the joys of riding a motorcycle in the early 20th century, they required something that not only kept them warm and dry, but also added an element of protection. It’s important at this point to differentiate the motorcycle jacket from the biker jacket. The latter is more American, cropped and usually found in black leather, whilst the former, and the style to covet this season, is quintessentially British, comes in a longer cut and features breast pockets and a belted waist. It is a silhouette that resonates with our obsession with all things vintage at the moment. The longer motorcycle jacket also looks much smarter due to its clean lines and refined cut, which ensures it can be worn by a larger cross section of ages. 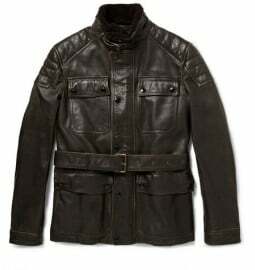 Belstaff has had the most money thrown at it recently. You may have seen David Beckham, their new ‘face’, opening the flagship store on New Bond Street in September. He was wearing a short, more traditional biker jacket, as the whole street thronged to sound of bikers and their machines. The event marked the announcement that David Beckham will front Belstaff’s spring/summer 2014 global advertising campaign, which will be photographed by Peter Lindberg and inspired by the late great Steve McQueen, who was a Belstaff customer. Originally established in 1924 in Stoke-on-Trent, Staffordshire by Eli Belovitch and his son Harry Grosberg, Belstaff experimented with rubber coatings to make their jackets waterproof, leading to their successful ‘Black Prince’ clothing line, which included the company’s first motorcycle jacket. The classic Belstaff ‘Trialmaster’ motorcycle jacket won the stamp of approval of many professional motorcyclists during champion trials in the 1950s and 1960s, and Ernesto ‘Che’ Guevara wore this very jacket during his legendary motorcycle ride across South America. 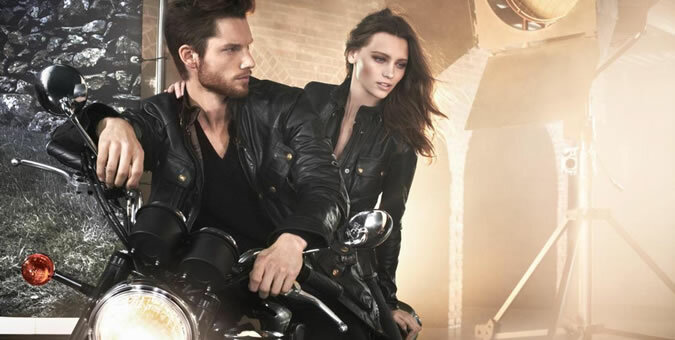 Although languishing a bit from its previous Italian owners, the brand was bought a couple of years ago by the Swiss Labelux Group (along with Harry Slatkin and Tommy Hilfiger) with the aim of taking Belstaff into the luxury market, all on the back of the motorcycle jacket. Now designed by Martin Cooper, who previously worked at Burberry, they have put ‘England’ back onto the labels and made the ‘Trialmaster’ jacket more desirable than ever. By showing us a contemporary way of wearing it, Belstaff is seducing us into rediscovering this classic piece of outerwear. Matchless was founded by Henry Herbert Collier, who made bicycles under the Matchless name in Plumstead, London in 1878. The first Matchless motorcycle was produced in 1899, and manufacturing began in 1901. All motorcycles were marked by a winged M on the tank – a symbol that shortly became synonymous with quality and a premium riding experience. Matchless has a long history of racing success; a Matchless ridden by Charlie Collier won the first single-cylinder race in the first Isle of Man TT in 1907. Film icons Marlon Brando and James Dean are also said to have been Matchless customers. It was the hobby of founder John Barbour’s son, Malcolm, which saw the Barbour company build a motorcycling range during the 1930s – more or less exclusively kitting out the British International motor racing team from 1936 onwards. The Barbour International jacket was worn by every British National Motorcycle team from 1936 to 1977, as well as 95 per cent of competitors at the 1965 TT Isle of Man race, and was a firm favourite with Steve McQueen, who sported the jacket with his American team in 1964 at the ISDT motorcycling race. 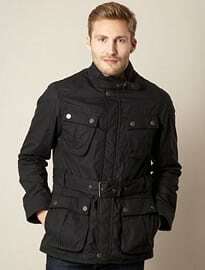 Everything about the construction of the Barbour International jacket is for practical purposes: the belt that secures the jacket from blowing around; the zip pull ring big enough for glove covered hands; and the ‘drunk’ left breast pocket, which is strategically placed for easy reaching with the right hand, ensuring the left hand can still manage the clutch. Other brands that have produced motorcycle jackets this season include British labels like Burberry Brit, Hackett and Jasper Conran at Debenhams. The most important element is the belt; without this it is just a plain field jacket. The belt allows the jacket to be cinched, which helps produce a strong waist and the desirable inverted ‘V’ shape (even if it is just an illusion). The motorcycle jacket is body-conscious, it should be worn fitted, but because of its length and the pockets, it will iron out a few of the body’s lumps and bumps, helping craft a streamlined silhouette and making you appear thinner in the process. 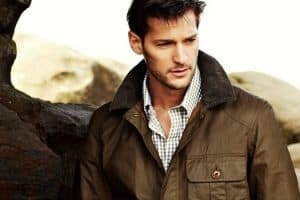 These are the type of jackets that look better with age – especially waxed cotton and leather versions, which will both develop unique character with continued wear. It is also a completely timeless silhouette that will see you comfortably from autumn right through to spring, so although they typically come with a slightly higher price point, they should be viewed as a versatile investment that will last you for years to come. A note of warning: consider length if you’re slightly shorter as this jacket will elongate your torso, making your legs appear even shorter. As the motorcycle jacket is essentially a field jacket with a belt, our previous styling advice applies. Completely versatile, it can be dressed up or down to suit the occasion or your personal style. 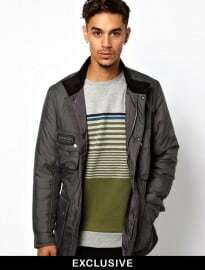 Wear with a chunky roll neck, like in the current Belstaff campaign, or a t-shirt and jeans combination at the weekend. 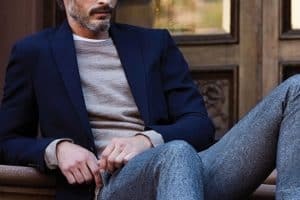 You could also choose to go the way of the country gent by pairing waxed styles with other heritage pieces and textures, such as tweed blazers, corduroys or brogue boots. Of course, leather motorcycle jackets are most at home when incorporated into edgy, biker-inspired ensembles. Think black skinny jeans, plain white tees, on trend biker boots and a dishevelled haircut. Channel your inner Marlon Brando or Steve McQueen and you will soon be oozing a sense of effortless cool. So there you have it, a classic, almost forgotten outerwear silhouette that is set to be pushed back into mainstream fashion’s consciousness as we move into 2014 and beyond. With luxury labels like Belstaff and Matchless set to make the motorcycle jacket their signature piece, the new iterations combine premium materials and high quality craftsmanship with a contemporary design aesthetic, offering the perfect balance of fashion and function. Whether you opt for waxed cotton or leather, the motorcycle jacket is a durable, versatile garment that continues to get better with age, making them a worthwhile investment for any style-conscious gent.